WatchESPN is an online streaming service for authenticated cable and satellite TV users in the United States. It offers 24/7 access to all broadcasts from channels such as ESPN, ESPN2, ESPN3, ESPN Deportes, ESPNU, ESPNews, Longhorn Network, SEC Network, SEC Network Plus, and ESPN Goal Line/Buzzer Beater on any mobile device, with the exception of NFL games being broadcast on the network's traditional channels. 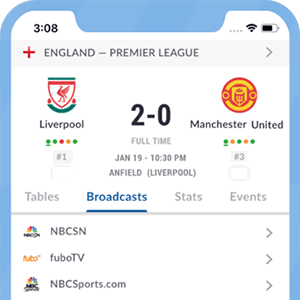 Football-related coverage of this service offers access to games from American and European leagues, with some friendly games featuring National Teams added to the mix. Although WatchESPN's live content is limited to cable/satellite TV users with authenticated access, the following IPTV companies provide access to its content: AT&T U-verse, Bright House Networks, Charter, Comcast XFINITY, Cox, DirecTV, DISH, Google Fiber, Midcontinent Communications, Optimum, Time Warner Cable, and Verizon FiOS TV. Affiliated users will have to provide the necessary credentials to access live content to all of ESPN's live broadcasts in this platform. Username and password will be provided by participating cable/satellite TV providers. WatchESPN's content is also available on Amazon Fire TV, Android, Kindle Fire, Android TV, i0S, and Apple TV. Chromecast, Playstation Vue and Xbox ONE users can also stream WatchESPN on the aforementioned devices. This service also allows fans to watch highlights and all of the network's on-set productions both live and on-demand. What channel is WatchESPN on? *Got itLive Soccer TV does not provide WatchESPN live streaming. The information provided on this page is simply WatchESPN soccer TV schedule. The USL has a national media partnership with ESPN, wherein all league matches are broadcast on ESPN+, ESPN3 and across linear channels. Play-offs and the final championship matches will air on a main ESPN network channel (ESPN2, ESPNU). Remaining matches are available on YouTube.